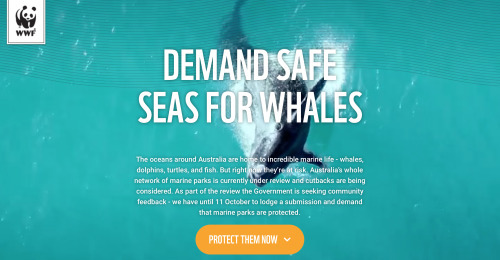 As the **fight to protect Australian marine parks from oil and gas developments**heats up, WWF Australia are setting the bar high for effective and stylish custom-coded campaigns with integrated Do Gooder actions. In the age of short attention spans, evocative presentation and multimedia are key to capturing the imagination of supporters – and WWF are doing a whale of a good job, garnering over 8,000 submissions in only a few days. Starting with a captivating video banner of migrating southern right whales seen overhead from an unmanned aerial vehicle, you scroll down to a streamlined educational component on the whales that pass through Australian waters. By the time you arrive at the action itself, followed by a call for donations to help drive the campaign, our hearts and minds are in and it’s impossible to turn a blind eye. Do Gooder was designed with this in mind: to function stylishly as a standalone campaign tool and integrate seamlessly with external platforms. If you haven’t added your voice to protect marine parks, now’s the time to do it. Then start your own Do Gooder campaign today with a 14 day free trial.